Our own private bartender and karaoke crooner looked like he’d stepped out of GQ for Cowboys, and he wasn’t the only one. Every wrangler was dreamy at The Ranch at Rock Creek outside Philipsburg, Mont. Like giggling schoolgirls, we secretly called it The Ranch at “Hottie” Creek. The Ranch at Rock Creek is 6,000-plus acres of rambling foothills and wildflower meadows fed by a blue-ribbon trout stream, Rock Creek. The owner, Jim Manley, grew up watching Westerns, and this spread has the feel of the Ponderosa, the famed Cartwright ranch on the 1960’s TV show Bonanza. Handsome ranch houses line the grassy meadows with spacious decks overlooking the mountains. Multi-generational families find these homes a good fit with amenities like wireless Internet, flat screen TVs and outdoor hot tubs. 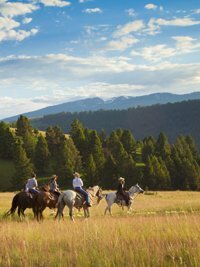 From here, you can launch out to explore the ranch and take day trips to “country chic” towns like Whitefish and Kalispell. Whitefish (population 8,000) is one of Budget Travel’s “10 coolest small towns in America.” It’s got its own ski resort, mountain lake and a postcard downtown that boasts a farm-to-table movement that’s been a way of life for generations. Unlike many ski resorts, Whitefish Mountain Resort is a big draw in every season. In summer, the ski area’s six zip lines soar 300 feet over the undulating terrain. The resort’s Walk in the Treetops is a nature hike high in the canopies of majestic native pines. In town, Whitefish is known for its restaurants with organic, seasonal fare. At a Café Kandahar’s Chef’s Table Dinner, you dine in the kitchen while acclaimed owner/chef Andy Blanton prepares delicacies like pork belly confit and elk tenderloin. Frommer’s calls this one of the two best restaurants in Montana. Another hot spot is Latitude 48, where diners can watch skilled chefs at work in an open kitchen. Nightlife in Whitefish sees an eclectic mix of cowboys and Canadians (a favorite cross-border vacation spot) and tourists from the West and beyond. But mostly, it’s locals who dance in the bars, to everything from bluegrass to rock. For live country music, drive 15 minutes outside town to Columbia Falls and the Blue Moon Saloon, where boots, hats and belt buckles are standard dress fare. I’ll be honest with you here: I haven’t yet been to the third dude ranch on the list — Triple Creek. It’s an adults-only resort in Darby, Mont., recognized by every publication from U.S. News to Travel + Leisure. The emphasis is on romance, whether it’s the romance of the Old West found in cattle drives (offered June through mid-October) or the spring vintner series. In the snowy season, a phenomenon called the Blue Light of Winter draws couples to the resort for tranquil moments in the aura of a pale blue light. A girl can always dream, and I’m holding out hope that my husband will surprise me with a stay at Triple Creek Ranch for an upcoming anniversary. In the meantime, I’m content to share lodging with girlfriends, who appreciate cowboys and karaoke as much as I do. Allegiant Air (www.allegiantair.com) has new nonstop flights between Oakland International Airport and Bozeman, Missoula, Kalispell and Billings, Mont. Resort rates range from $1,000 per night, per couple, for glamping at Paws Up (includes meals) to $2,600 per night (includes meals and activities) for a luxury cabin for six people at The Ranch at Rock Creek.